When we walk into her Greater Noida studio on a hot Sunday afternoon, she’s hardly in weekend mode. Poring over labourers to finish the glasswork hours before leaving for her next trip, Anita Dube confesses that being selected as the curator for the 2018 Kochi-Muziris Biennale is something that she never really foresaw. Hence, the excitement is rather paramount. She went on to study history at Lady Shri Ram College, Delhi, and later found herself in two minds about whether to choose art history or comparative literature. “I got a call from Maharaja Sayajirao University, Vadodara where I had a wonderful interview with Gulam Mohammed Sheikh, who was faculty there, and was admitted into the MA art criticism course. However at that stage I couldn’t imagine that I would make art one day,” she reminisces. Sporting her trademark bindi, Dube’s persona reflects in the studio she has been renovating for a year now. It’s stark and monochromatic but there are nooks and crannies that host some of her unique creations. While she converses about her journey into the world of art and her plans for the upcoming biennale, you see those sparks of insight that she is celebrated for. 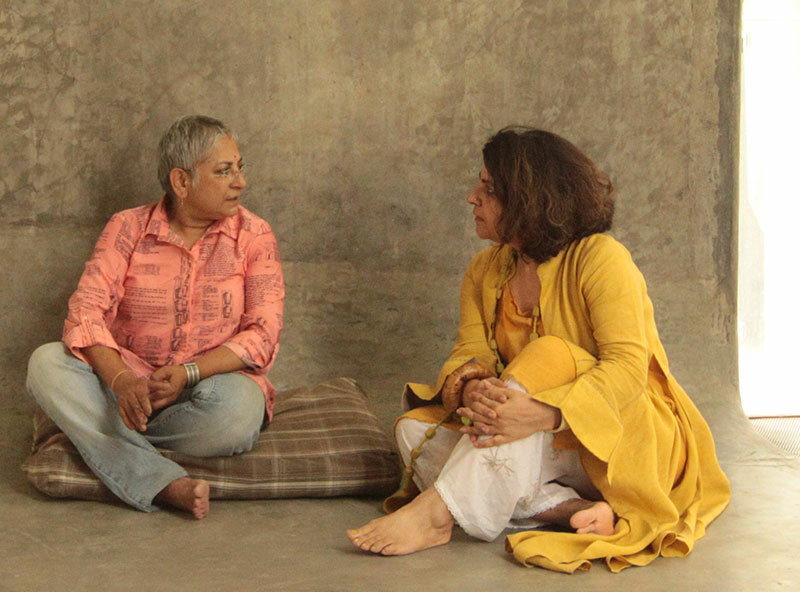 Her repartee with her friend — painter and photographer Manisha Gera Baswani, who has been closely following her oeuvre — is relaxed, and certainly what Sunday afternoons are made for. Excerpts from a memorable exchange…. Manisha Gera Baswani: When did you actually start making art? 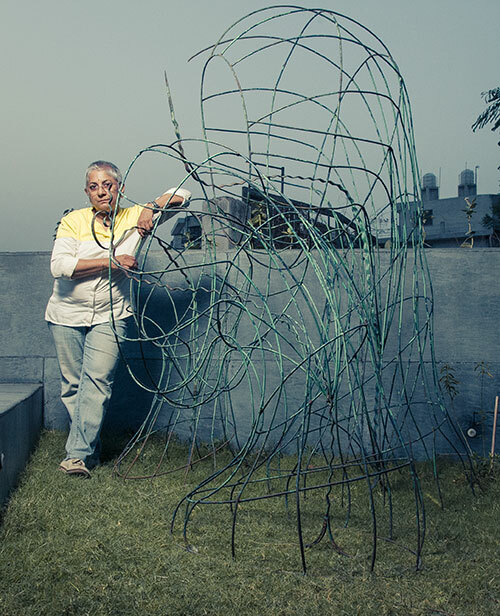 Anita Dube: My MA dissertation was on contemporary Indian sculpture. So clearly sculpture was what attracted me. Then I married Alex Mathew who did wonderful carvings in wood. While he and Asokan Poduwal were making an outdoor mural for IPCL in Vadodara I felt like making two monkeys sitting on top of it. The process was tremendously exciting, working on a scaffolding with armature and cement. Perhaps we can say now that this was a beginning. And every time I made something, even if it was small, it felt more real and somehow easier than my work as a researcher in art history. Tell us about the Indian Radical Painters and Sculptors Association that you were a part of. You were the only woman and non-Malayali in the group, right? The Radicals happened because I was married to Alex who was part of the group. I come from a professional medical family; political awareness came to me through my time with Alex and his friends. It was through them that I became conscious of class inequality and struggles. Has the fact that you were born to doctors influenced your choice of materials, for example the use of human bones in Blood Wedding? Certain crises can really take you to another level. My father was diagnosed with a fatal strain of cancer late in 1996. In that terrible time I found a sack of bones in the storeroom of the family house (earlier used by my brother while studying medicine). Unconsciously I brought them to my studio in Delhi and started working with them. I then realised I could use anything in my art making and found objects were invested with everything I wanted to talk about. Would you say that they were ‘found’ objects or do you think in hindsight you ‘selected’ them? You already have inside you an emotional climate as well as an ideational climate, which is why you select a particular object. You may have crossed that same object a year ago with no resonance at all because you were not in the place where it makes perfect sense. We only see and receive when we are ready to, and then, the found object magically appears! Text has been an important part in your recent work but it took a while to become integrated in your practice, given you spent so many years as a critic and art historian. It took a long time for me to realise that my childhood and medical environment could be a source to make art. Similarly writing and sculpture were separate. Only now am I able to bring disparate things together, to work against separation. When I started with word sculptures, there were single words like ‘silence’, ‘woman’, ‘wound’, or phrases like ‘about ethics’. With later works however it became like a jungle — as if you are entering a labyrinth or a forest of words. I don’t know why but I started to enjoy the denseness of it. I have used poems, short stories and text fragments as material, as armature, as layers to construct work like Three Texts. You were at Kanoria Centre for Arts in 1984 where you had a studio and were even given a stipend. Do you feel we need more such spaces where the artists and viewers can come together? The Kochi-Muziris biennale is one such space…. In the last 10 years so much has happened in the art world. Earlier, artists were satisfied being in their studios and having a signature style. Somehow my generation is restless, more open to experimenting with form. What do you attribute this restlessness to? It has to do with exposure, physical and intellectual mobility, thanks to the internet. Once you are mobile, you encounter the world. You are no longer satisfied with what you have. You see, learn, grow, compare and then you make decisions. You have delved in so many mediums like performance, video, photography, velvet and more. Do you see all of these coming together in your choice of artists at the Kochi biennale? I will work through feminism, yes, definitely. Also with Marxist ideas which are becoming increasingly relevant today. The biennale should make people think that these are interesting ways through which to understand our world. We all have many ideas but a big platform like this to execute them is a wonderful challenge that comes rarely. For me it will not be about success or failure but about joy and a sense of participation that I hope to create. The fact that you are creating it in Kerala must be so much more special in that case? I guess it is the only place in India where Marxism is alive and holding its ground. When you talk about women’s issues are you looking only at female artists? There are a lot of women whom I admire, have affection for, having followed their practices for so many years. So it’s my chance to pay homage to them. But I am also looking at male artists who work with intimacy as a theme. So yes, I would actually go for intimacy and move away from the spectacular. You can say therefore that the biennale will be feminine, but it will be a tough kind of femininity. One which is in line with the way I work and function. You have also spoken about exploring the idea of ‘non-alienation’ at the biennale. Can you elaborate? Yes, I want people to dialogue with art and with each other in the biennale. It should not be a cold and dry experience. They should get energy from it. It should also be educative and enjoyable because pleasure is an important emotion in my practice. I hope to create an embodied environment for viewers to express themselves. Aren’t you also practising this in your art and the way you live your life? As I sit in your amazing studio, I see that you have not put up a boundary wall…. While making my studio, I told Madhav, my architect, that I did not want one. So it was decided that a low wall will function as a bench whereby I can connect with the outside world and they can connect with me. People come and sit on the bench and relax. The workers and I used to see movies occasionally after a hard day’s work. I would like to carry over some of these ideas to my vision for the biennale. I don’t want boundaries and confinement. It is about reducing the walls and increasing interaction. You mentioned wanting to create a similar space of dialogue and interaction in your studio. One where there are people creating and living at any given point of time, sharing art, conversations, experiences. Yes, that is how I imagine my current studio. If you have lived alone for as long as I have, you don’t want to grow old and get bored. It will be great to be surrounded by the energy of friends and young people. I can’t fund all this on my own but I will work with some foundation to make it possible. Visualising my studio, designing it with Madhav and Anagram Architects, dealing with all sorts of contractors and artisans has been a huge learning curve. It is very difficult if you are a single woman without financial support. I guess it has definitely prepared me to take on a much bigger project like the Kochi Biennale. I want to talk about the bindi that I have seen you wear for as long as I have known you, which is almost 25 years. I have worn it from the time I can remember, since my teenage years. In the morning when I put the bindi on my forehead, it gives me a zing! It is odd I guess, since I wear trousers and shirts. Whatever I wear, I put on a bindi! These strange contradictions make me modern, part provincial and part metropolitan, and I am comfortable with this mix. Looking back, how do you feel about the choices you have made and where you are today? Really it has been an unpredictable journey, much like a flowing river that takes many turns. Instinct has played an important role and continues to do so in my art and life. I am preoccupied with Kochi, and hope to give it my best. Once Kochi is over I will use my skills to complete my studio project and experiment and collaborate with friends and fellow travellers through residencies and other programmes.